The Philippines’ long road to recovery after Yolanda: Are Filipinos up to the task? November 19, 2013 November 19, 2013 - by benign0 - 37 Comments. In the aftermath of the devastation wrought by Typhoon Yolanda (a.k.a. Haiyan) the hard question stares us squarely in the face: What’s next for a nation that, even in normal times, struggles to deliver the most basic services to the majority of its people?. “The evacuation centers are an increasing concern,” said Matthew Cochrane, spokesman for the United Nations Office for the Coordination of Humanitarian Affairs. Places like the Tacloban City Convention Center, an indoor basketball stadium now home to some 2,500 people who lost their homes in the storm, are straining under the lack of sanitation and basic supplies. “People are living in squalid conditions in need of as much support as they can get,” Mr. Cochrane said. In addition, about 2.5 million people require food aid. “The most pressing need is food,” he said. Japan on Monday dispatched two warships, carrying some 650 troops, to the typhoon-ravaged Philippines in the first major contingent of the military’s largest overseas aid deployment. The two vessels, also carrying six helicopters, left the western port of Kure and are scheduled to arrive in the Philippines on Friday, said a defence ministry spokesman. 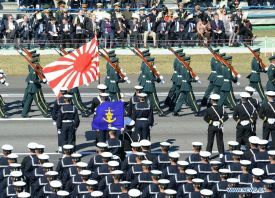 He added that Japan’s Self-Defense Forces (SDF) are sending a total of 10 planes Monday to the disaster-struck nation — seven C-130 transport planes, two KC-767 tanker planes and one U-4 multi-purpose support aircraft. 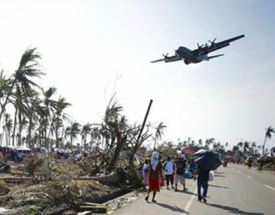 And as that is going on, the awesome might of the United States’ armed forces is already at work delivering goods and services to Filipinos across the ravaged areas. Just as interesting is the fact that Tacloban is also the site of the landing of General Douglas MacArthur’s liberating forces in October, 1944. The Americans have, indeed, returned a second time! It is good timing as well. As relief supplies and funding spurred by volunteers from the private sector ramp down as Filipinos overseas and in unaffected areas begin to tick the have-done-my-part-for-this-disaster box on their To-Do Lists, the enormity of what still needs to be done still looms in the bleak horizon. Only the macro resources of competent national governments can save Yolanda’s victims now over the long haul as private citizens get back to running their personal lives and private businesses get back to the business of, well, business. “The economy will have to reflect the GDP downgrade and slowly the market will adjust and price that in. So maybe give it a couple of months or maybe a quarter of correction before things will come back to normal and look at the economic prospects again for the Philippines moving forward,” he said. A third of the country’s rice-producing land was decimated by the super storm, known locally as typhoon Yolanda, according to US-based Commodity Weather Group. These areas were already among the country’s poorest. The Philippines Department of Finance says rice crops were the hardest hit, with about 67,000 hectares destroyed, and that figure is likely to climb significantly as inspection teams reach more remote areas. The Manila-based department estimates the average income in the hardest hit areas will drop by 25 per cent over the next six months. Millions of Filipinos will be looking to the heavens for relief for many months to come. As the picture of what the future holds for millions of Filipinos affected by this disaster gets bleaker, the on-going crisis of trust being suffered by the government of Philippine President Benigno Simeon “BS” Aquino III becomes a more pressing issue. Much of the groundwork that widened Filipinos’ already long-gaping exposure to catastrophic collapse in the event of a major calamity such as what Yolanda has brought on to this hapless nation was laid by decades and decades of institutionalised thievery perpetrated by Filipinos’ popularly-elected politicians. Critics of Manila’s muted response to the typhoon say the storm exposed many of the archipelago’s long-festering problems of corruption and government incompetence, particularly a weak central government and provincial governors who wield virtual autonomy over their fiefdoms, keeping millions of Filipinos below the poverty line. ”Corruption has been here forever. It’s a matter of minimising it, really,” chief economist of the Department of Finance Gil Beltran said. Much infrastructure and whatever semblance of social development enjoyed by small towns and cities such as Tacloban and Ormoc — the two most flattened communities following Yolanda’s visit — rely on “pork barrel” funds dangled in front of their voters by Filipino legislators. Whatever funds “promised” by these politicians for “development” projects get allocated to works that lack scale — the odd waiting shed or “welcome” arch, various small community works, some (according to legend) “scholarship” grants, etc. That is, funds net of whatever “commissions” these politicians feel they are entitled to as a reward for their “generosity” to their constituents. For real recovery and rebuilding to happen, the leaks in the pipes that channel resources from the millions of eager benefactors and taxpayers need to be plugged and the pilferers of this leakage put away permanently. And once funds make it to where they are supposed to go, the way these are spent need to be well-thought-out. This requires thinking at a depth and scale that has long eluded Filipinos as is evident in the manner with which the same politicians and the same politics continue to infest Philippine society. Great piece yet again, benign0! Indeed, this may be the lowest the Philippines has ever gotten, and it doesn’t help give us hope that everything will be okay if we consider the kind of leadership we have. Not knowing what to do is not very encouraging, but being so arrogant as not to admit it (and to pass the blame onto someone else) and thus not to seek help from people who may know what to do, and worse, not caring enough for the hapless victims to really move heaven and earth to find out what needs to be done to help them rebuild their lives, is a crime. If the president is not up to the task, he should step down and let someone else do it. I have read on the news that Pnoy will conduct investigation of the LGUs at Tacloban…. seems like another fault finding session and vindctiveness rolled into one. I cannot see recovery as one of his priorities, but rather repeatedly, just to look good. PUROPAGANDA. I sometimes think he got a psychological problem. He knows its bad but he just can’t help doing it. The pnoy strategy of trying to lay the blame on lgu’s is not only a desperate attempt to deflect vald criticism against him but completely inappropriate. An independent review – not possible in philippines – on lessons to be learnt – could have been beneficial, but pnoy trying to misguidingly trying to allocate blame before victims have even been buried is sick, and shows his lack of calibre or any sensitivity to the victims/situation. Pnoy aquino plumbs the depths of moral reprehensibility. All pork barrel should be suspended for a year and those funds should be channeled into the support and reconstruction of the Eastern Visayas. Frankly I just hope this catastrophic event just became a game changer in the coming 2016 election. I’m afraid that it might still be the same. People, especially in the typhoon affected areas, may have become a lot more desperate. Politicians may use that to their advantage. Back to the same old wreck that is the Philippine Government. 3 years after the haiti earthquake which killed 200,000 people and resulted in more than 10 billion dollars of aid, 350,000 still live in tent cities. Politicking, corruption, lack of organisation, lack of requisite skills, and ngo fragmentation/self-interest, all combined to ensure that the earthquake was only the first disaster, and any opportunity to rebuild was squandered through ineptitude, incompetence, and infighting. The current signs for the philippines already do not augur well, and if past responses and current attitudes prevail, then is not a snowballs chance in hell that a phoenix will rise from the ashes. Such a situation demands a creative solution and a long term independent body to oversee and coordinate. Whether it is short term supplies or longer term contracts for infrastructure, housing, the political vultures and fake ngo’s will already be circling, and all 2016 candidates looking for whatever mileage they can get. Death in the philippines is always seen as an opportunity for someone – even incompetent presidents. That means they’ll need to keep the Leyte victims in tents for the next three years. To have an issue to talk about come election time. Great article benign0 and great comment Chrissie (although we can’t expect much from the binays). As I am watching TV, I am getting sick and tired of seeing artistas telling the whole world about their cause. Just this morning, media-irritant, kris aquino complained that she had to take two tablets of biogesic because she was feeling bad. She had been to “remote” places to bring some relief goods. Then you have Richard Gomez who talks as if he knows everything. Then another up-and-coming teenage “mutant” artist went on air (a couple of days ago) telling the whole word about the stuff he had gathered from his family only to end up plugging his first concert. Point is, EVERYBODY is helping. But I think only a couple of Filipinos are giving the aftermath a thought. As of the moment, thousands of survivors are landing in Manila and Cebu. Sure, they will be accommodated in tent cities….but what’s next? In my idiotic and education-deprived head, I’m seeing a bigger problem…much bigger than the destruction brought about by Yolanda. Benign0, you wrote a really great article. Although, I don’t think most of the Filipinos will understand it. I would like to be wrong about that. I know that there are a lot of Filipino experts that can help with the recovery. But I hope they’re not waiting for the next big project from any funding institution so that they can share their expertise (at a very high professional fee). Out government is a disaster and will continue to be unless they acknowledge the fact that they have limited intelligence. So going back to your question: Are the Filipinos up to the task? My answer: As tax-payers, do we have a choice? usually those that have ti say they are helping are the ones who are not putting their hand in their own pocket, but some sponsor is providing. I agree with you. It’s a big business. It’s also proven to be onion-skinned. It’s actually impervious, if you ask me. To criticism, development, evolution, improvement, etc. There is a HUGE difference between water-proof and having zero choices. If you go back to the well-written article, benigno gave the facts and I gave an opinion. Of course, you won’t respond since you’re a real-life FRAUD. Too bad, that spirit has departed since, thanks to Aquino, the body in which that spirit used to reside is not itself waterproof. The Aquino gov’t also did a great deal in crushing that spirit. The biggest long term capital cost will be housing – so apart from whether housing czar binay will be given any responsibility, and therefore potential 2016 exposure/kudos – is whether the country will take advantage of low cost housing solutions now available worldwide. Kenya is building 250,000 such houses this year. The important point is that if countries do not start long term rebuilding as soon as possible and instead spend their time ‘talking, reviewing’ etc, then predictably 3 things happen – governments/priorities change: aid money quickly disappears on short term solutions etc: the long term plans are never implemented/achieved. The financial injection via aid and via a realignment of 2014/2015 national budget can create jobs and reskill locals. There is now a concerted movement driven by pnoy/lp to use the yolanda tragedy as an excuse to retain pork/pdaf/dap. How sick, greedy, and unprincipled can filipino politicians get. when the focus should be on the victims and rebuilding, these low life are intent upon ensuring their 20 million + pesos per annum ‘salaries’ are not swept away. Tweedledum and Tweedledee (aquino roxas) have been reduced to a side show. They are currently walking around the Visayas smiling waving to the crowds and handing out bottles of water. The international community has now totally ignored them and focused on the job at hand. These two idiots are now the laughing stock of the world and are being ridiculed by everyone. and blame everyone and anyone apart from himself. If Saddam Hussein had the Mother of all Battles then Aquino’s PPP is the Mother of all Failures. Going forward my heart goes out to your fellow countrymen down south, what will they do? how will they survive? how will they rebuild? and above all when the International Community starts to leave what will they do for food? The dictator BS Aquino was seen in the news as into blame games again. He is asking why there are still plenty of bodies under the storm wreckage. It is common sense BS! When the wind waltzed with the sea waves the storm surge was the killer. Why don’t you give the victims motivation and hope instead of point and blame? No planning, organizing, directing and controlling… More of epal games! Buking na kayo BS! Oh by the way, the breaking news says that the PDAF was declared unconstitutional by the SC. Resign BS Aquino! Resign together with the rest of the senate and congress. After this big fumble, they should all just resign if they really have nothing going for them but their measly monthly salaries. It would be easy for them, kung ang mawawala lang sa kanila ay mga monthly salary nila. I dare them. Prove their honesty and integrity once and for all by doing just that. This is an appeal to all concerned relief organizations. Food, water and other relief is not the only items needed in the disaster areas. Give them hope in the form of flashlights, batteries, candles and portable generators complete with wiring sockets and energy saving bulbs. Give them tools to clear the debris and construction materials to build their homes. Organize them to clean up, bury(they need body bags) and even police (tanods) their areas along with AFP/PNP overwatch. I frown on the epal people and the grandstanders who do nothing but photo ops, video shoots and political circuses at our expense. Perhaps the guys and gals among you can transmit this to others. Let us give those people hope and motivate them to live again. More ideas for transmittal are welcome. Mabuhay ang Pilipinas! Down with BS Aquino the blame games con artist and epal king!!! Apparently, the situation in Tacloban has been desperate already. More and more people don’t have food and water. Most children are suffering from diarrhea and vomiting. Others are dehydrated. The reason why they transferred to other places. Typhoon Yolanda sliced eastern and central Vizayas by the fastest wind speeds on record. It has killed and left missing estimated more than 5,000 people and displaced an estimated 4 million people as reported. Several countries joint forces launch international relief mission to help the survivors, consequently many of whom will be dependent on aid for months to come. The unforeseen potential problem in the long run will be if the residents of many cities, barrios and towns start relying free food supplies from relief organizations. This kind of scenario has happened in Haiti, where the flooding of food continued for months that ceased the farmers to go back to tending the fields and growing their own crops. Envisage similarly, the relief benefactors in the Philippines will continue relying on “food aid”, which is easy to get. The local produce food will experience severely depress prices as food comes for free from donors. This would also hamper the motivation of local farmers to sell their crop to make a little bit of money to augment his labor and supplies and fuel needs e.g. transportation and irrigation. Nobody will buy his crop especially when the abundant supply of free food floods the area. One of the most important feat that these Aid Organizations to do is to quickly convert the food aid coming from abroad to food aid purchased domestically from the farmers of the land. Then expanding this local food purchasing until it captures the mindset of the smallest land tillers. This will result encouraging more farmers to grow their own crop even though it may have been devastated by the super typhoon Yolanda or other after effects. Next important factor in rebuilding infrastructures devastated by the typhoon, is to inspirit the local resident to restore their own provinces by hiring the majority of workers from their domestic labor force. Then we will witness the progress of both tangible and intangible things through the people. Japan must be forgiven by Filipinos. Imperial Japan was the one that invaded countries in World War II. The Japanese militarist in their society. Most of them, are rich landowners. Were the ones who made Japan invade other countries. When U.S. Gen. McArthur was the ruler of Japan. The first thing he did was: Land Reform. Look at land reformed Japan now.For us, we are still in the Feudal Age. With, Mr. Aquino as the biggest Feudal Master of the nation. The Senators and Congressmen are mostly Feudal Lords. The Aquino administration never has any plans for recovery in any disaster. Mr. Aquino is a lazy and incompetent President. His cahoots, are similar to him. Same intellectual calibers. “Wala nang silang ibubuga.” All they do, is pander infront of the foreign reporters’ cameras. Make themselves important. years. Election is around the corner now. These idiots are positioning themselves to run. This calamity can be their “starting sound” for the 2016 election. 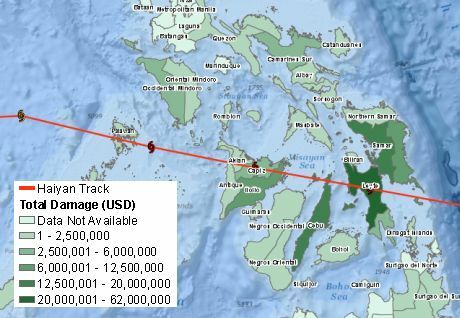 Tacloban was the first city in Region VIII to become a “Highly Urbanized City” and is considered the largest city in terms of population in Eastern Visayas, having a total of 221,174 and with a density of 1,100/km² as recorded in 2010. In an extensive survey conducted by the Asian Institute of Management Policy Center and released in July 2010, Tacloban City was ranked among the top ten most competitive cities in the Philippines. Tacloban ranked fifth overall, and second in the emerging cities category. Tacloban was briefly the capital of the Philippines, from 20 October 1944 to 27 February 1945. Tacloban also has an important place in the Philippines’s history. In 1944 it was the first Filipino city to be liberated from Japanese forces by combined Filipino and American troops. 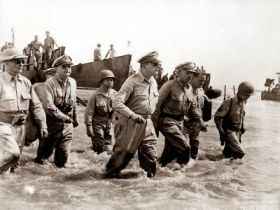 That came two years after US general Douglas MacArthur was forced to leave the Philippines in the face of a Japanese onslaught. He promised that he would return to lead the counter-invasion, and famously fulfilled his vow at the nearby Red Beach in 1944. The scale of devastation is still being measured in wake of typhoon Yolanda, one of the worst storms in recorded history. It wiped away homes and everything else in its path with giant waves and ferocious winds. However, this is not the first time Tacloban was hit by a strong natural disaster. One hundred one years ago, in 26 November 1912, practically destroyed Tacloban, the capital of Leyte, and to have wrought enormous damage and loss of life at Capiz, the capital of the province of Capiz,” the report said. The typhoon that hit Visayas probably killed and wounded 15,000 people, a report from the American newspaper the Washington Herald said. “Are Filipinos up to the task?” –Definitely YES, because based on factual historical events, Filipinos are born to surpass any kind of disaster they face. To stabilize communities through short-term, International and local interventions is must needed support, by providing equipment and technical assistance; and increased citizen engagement through swift and accurate information dissemination. •Employ approximately 44,234 local manpower including women, to remove tons and tons of rubble. •Rebuild educational facilities to allow students to return to school. •Provide vocational training to women and men via local vocational schools. •Improve the local government service delivery. It is clear that we need more faceless leaders, and more educators, and tons of conscience. Our politicians, as has been the case for decades, are useless for the most part. Government to them is a business, and everybody here knows that. They have absolutely no conscience whatsoever. Nada. Zero. How they can stomach the squalid conditions the survivors are experiencing now, is totally unfathomable and unforgivable. And in a country where votes continue to be bought and sold because of an uneducated and underprivileged majority, you can clearly see where this country is headed. Our educational system is itself corrupt and run by fools. Quality education is something only the rich can afford, and it is sad to see how many of their spoiled children take this gift for granted. The majority in the meantime have limited access to real education that empowers them, and affords them better control of their destiny. Faceless leaders. Leaders with a conscience. And a relevant educational system accessible to all. All are extremely rare in this country, and almost non-existent. So what are we to do? Maybe the answer lies here at GPC, where intelligent critics seem to lie in wait for the next big wave — whatever that means. I think we need a Yolanda to erase our current crop of politicians, or what has been called the biggest crime syndicate ever. I’m just glad the Supreme Court has banned the pork barrel. That definitely is a start and commendable. Surprised me that’s for sure. Very well said, grumpy citizen, and you certainly didn’t seem grumpy at all with that comment of yours, just very objective and no-nonsense. I spent the best 17 years of my life in education and educational publishing, and I can tell you that there’s not much hope either in our educational system as it’s controlled by people who think they know everything and can’t think out of the box. As for educational publishing, it’s run by people who couldn’t care less about good education, only profits galore from the sale of good-for-nothing textbooks. I’ve devoted practically all my life so far trying to bring about the changes I think we need in the realm of education as I also believe that it’s good education that will save our country, but to no avail. I pray we wake up one day before it’s too late. 🙁 So sad to hear that. Even if I was young, I knew there is really something sinister wrong with those textbooks that I have in elementary. I know there is someone who already exposed years ago (I think the guy’s family name is Go), about the tons of errors in Philippine textbooks. But then, this is the mighty Failippines, the land of ‘pwede na yan mentality’ and ‘bahala na’ attitude. I bet my bottom benchinko that nothing changed even if he exposed that scandal. Goes with every concerned Filipinos who expose scams and scandals every government crooks had done and will be doing in the future. Many publishing companies manage to get their textbooks adopted by schools by promising them new vehicles, funding for a new science laboratory, funding for the teachers’ outing/out-of-country seminars, a new building, etc. It’s no longer really about the quality of the textbooks. I have personal knowledge of this. One school adopted the textbooks for all their subjects for 5 years from a single publishing company in exchange for a brand new Toyota Grandia. So many critical and rational reports around the world telling us STRAIGHT in the face that what happened to the Visayas region is a HUGE problem that will terribly our country. But alas, our Itlog Penoy president still continues to downplay this horrible disaster as something they can handle, whereas they CANNOT! Somebody hit this pathetic excuse for a man in the head. A crowbar or a 100% steel might suffice. yolanda is simply payback for years of corruption on the part of the government, and stupidity on the part of the voters. either people wake up and stop being a global liability, or better to sink all 7,107 islands. am fed up with hearing it.